Remember that Kavanaugh is just the latest and to-date most cynical and potentially destructive example of the Gyno-Fascism of the Feminazis that make up this toxic wave of Feminism we’re dealing with. 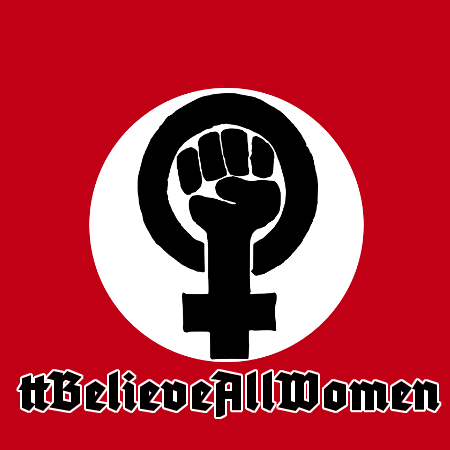 The very idea behind #BelieveAllWomen is that the mere accusation of a man by a womyn is proof of guilt and all better get on board persecuting that man unless they too wish to be decried as Untermensch. It must become clear to everybody in America, even to the last barista, that Masculinity is equal to subhumanity. This must be clearly outlined until every womyn of America has it encoded in her subconsciousness that every Man, whether a worker or intellectual, should be treated like vermin. Now, they’re not quite ready to declare us as being Unnütze Esser or Lebensunwertes Leben and I doubt that any of the Gyno-Fascists would that far. No, the Feminazis will probably satisfy themselves with declaring men to be Untermensch because, whether they like it and us or not, we’re too useful to them. Hence, their Generalplan Amerika (GPA) will be very unlikely to include gender-cleansing. Their doctrine of Sichersraum will, in all reasonable likelihood, just include the subjugation and re-education of men rather than their extermination. And yes, it not only can happen here, it is already happening here. Whenever it is demanded that certain classes’ allegations or accusations are, in and of themselves, enough for verdict of guilt and subsequent punishment, one is creating an Ubermensch and Untermensch paradigm. And that is exactly what the braunröcke of #MeToo, #IBelieveHer, and #BelieveAllWomen are doing. This entry was posted on Wednesday, September 26th, 2018 at 8:36 am and is filed under Politics, Society. You can leave a response, or trackback from your own site.